See this one and more on the “triangle” body type page. Start with the Poplin website when you are looking for something new. Simply start under the, "learn" drop down and select your body type. If you aren't sure what it is, begin with the section on body types. Helpful hint: If you don't see images from Pinterest on your body type board, simply hit refresh. New items are pinned everyday. So, expect lots of options whenever you visit. Also, feel free to check out boards for other body types, too. Often, there are ways to style those pieces to make them work for your figure. Have questions? Just ask! From the Poplin Style 1st Anniversary Party at Freeman in Capitol Hill with some of my favorite folks and early supporters. Four years later, the partnerships continue to grow. As a personal stylist for women, a VERY common question I hear is, "do you know someone who...?" Often, my answer is, "yes!" That's why I'm elated to introduce the Partnerships portion of the website. Look there to find my very favorite brands and people so that you can take full advantage of the super cool folks I've found along my journey. I'm kicking things off with a woman who is essential to my life. When you see her, tell her I sent you. Additional hanging storage helps you get pieces out of your current closet that don’t belong. Specifically, these pieces DO communicate your personal style and ARE flattering for your figure. However they are off season or don’t fit right now but are within a reasonable range for you that they will fit soon. The best place to shop is in your own closet. The 2nd best place to shop is your hanging storage. Let's face it: there are some things you simply MUST have to make it possible to look and feel stylish despite your hectic schedule. The Style Essentials page is an ever-increasing list of those life-changing items. Check it now. Check it later. I'll keep adding essentials as I discover them. As always, let me know what you think or if you have anything you think should be on that page. Here’s a behind the scenes shot from Delight’s photo shoot. As you can see, sneakers and a backpack are my go-to for these adventure-filled days. Also, if you are loving my hair in this shot, it’s courtesy of my hairdresser. Both of these photo shoots were with photographer Amy Paine with hair and makeup by Kat St. John. 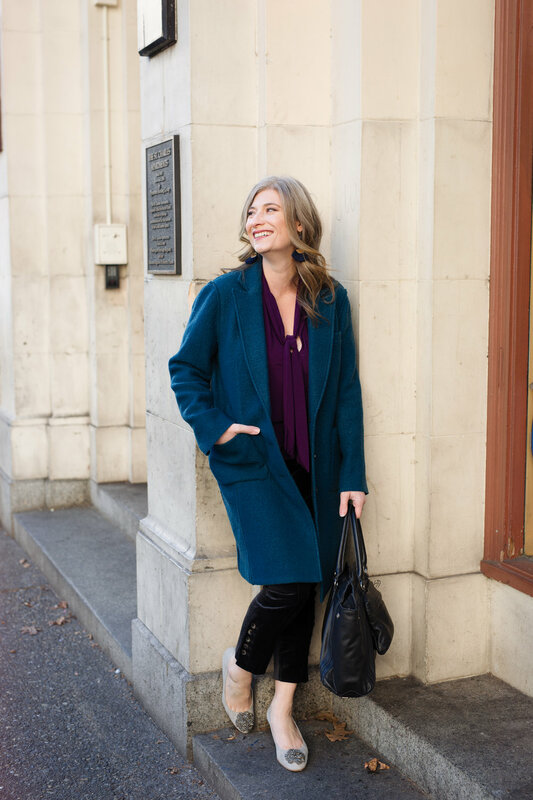 I hear so much feedback from women about the Poplin clients they see on the blog and Instagram. It can be really inspiring to see someone else who you identify with. Therefore, we're showing off more clients on the blog. Yes, there are more photos. Even better, learn more about each woman. Learn about her life, our approach to her style and hear her thoughts on the process. Here are two of my recent favorites: Delight (left) and Becky (right). Remember, every Poplin client is wearing her own clothing. We pick up new pieces to complement her existing options and edit her closet to be sure she has just the right items to complete her looks and simplify her life. You can also see more clients on the new Client Stories page. SO much good stuff! As always, thanks very much for being here. I'm grateful to have a job I love working with incredible people. That means you. Remember these beauties from the spring re-souL giveaway? It’s just an example of what you can win when you enter. I also ran into these at my client’s house this week when making outfits. So exciting! One lucky reader won a a full set of lash extensions from the Lash Factory. 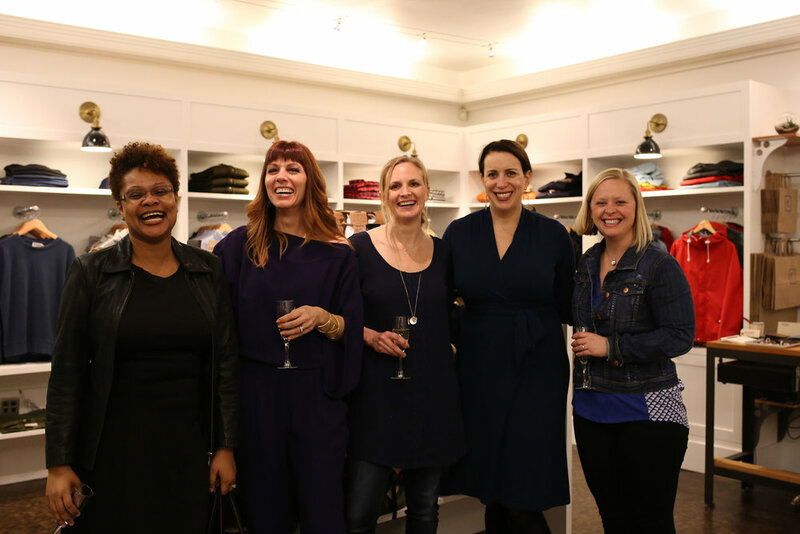 Did you make it to the Poplin Style event at the Universal Standard showroom? We were the very first folks to hold an event there. That partnership continues to flourish. The brand now carries size 6-32 including petites! One last thing: 2019 is the year of giveaways. Get ready! All email subscribers are entered into giveaways. You can increase your chances of winning by sharing. See each giveaway for details. Need more incentive? For now, make sure you are on the list!